Originally introduced as ‘all-new’ in 2010, the sixth generation Golf 4-door hatchback showed new fresh, dynamic styling inside and out. 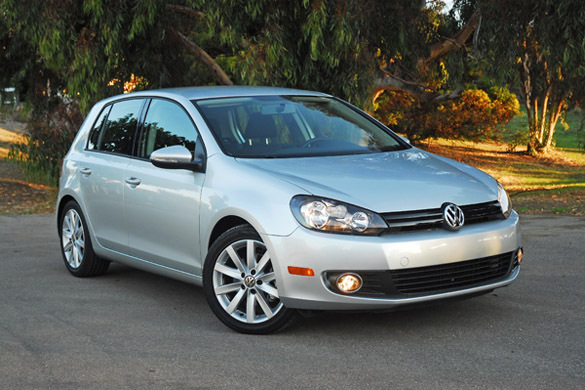 I just finished testing the 2011 version with little changes over the 2010 model and had so much fun driving the athletic yet extremely fuel efficient TDI clean diesel engine mated to VW’s six-speed manual transmission. From the first glance, the 2011 Golf proudly shows off the new ‘face’ of the VW brand with an all-new front end design that includes a wider, doublebar grille that blends into angled halogen headlamps, (HID lights optional for the TDI), for a sportier look. The body-colored bumper sits above a revised lower front fascia featuring a wide-mouthed cooling duct. Crystalline oval foglamps complete the front fascia. These elements combined with the Golf’s wider appearance give the hatchback a more commanding road presence. Black window trim and the absence of side moldings keep things simple along the sides, for a cleaner look that remains pleasing to the eye. Heading to the rear, a hatch spoiler with integrated third brake light sits atop the hatch and is painted to match the rest of the body while touching on the Golf’s sporty capabilities. Updated taillights mimic their counterparts from up front, and feature integrated clear turn signal and reverse indicators along the bottom edge. Running lights are blended into the lower rear bumper which adds a blacked out insert and cutout for the dual exhaust tips. 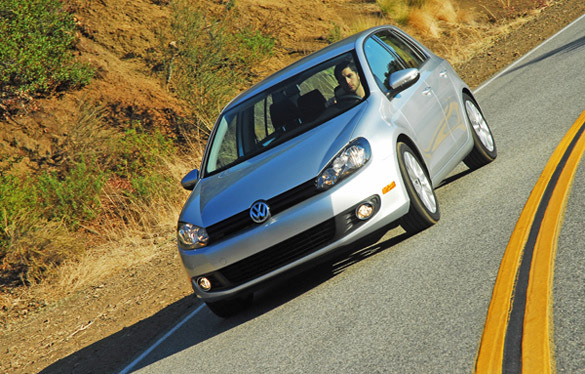 I like driving high-mileage cars and the new VW Golf TDI is one of the best non-hybrid models available. The fuel sipping compacts emits 25% less greenhouse gas and achieves more than 30% better fuel economy compared to a similar gasoline engine. The car is equipped with a 2.0 liter clean diesel TDI engine that is marked by its fusion of German-tuned performance and impressive fuel economy-complements of an advanced electronically controlled turbocharger and the electronically controlled direct injection fuel system. The valve train consists of a single overhead camshaft, four-valves per cylinder and maintenance-free hydraulic lifters for added piece of mind. All combined the 2.0 liter powerhouse produces 140hp at 4,000rpm and an impressive 236lb.ft. of torque between 1,750 and 2,500rpm. That is plenty of torque to get you where you want to go fast and with less emissions. To deliver all that power to the road smoothly, a traditional, close-ratio, six-speed manual transmission comes standard on the clean diesel TDI, and is good for an EPA-estimated 30mpg/city and 41mpg/highway, and 0-60mph in just 8.6sec., much faster than any hybrid in the segment. You can also chose an optional six-speed automatic Direct Shift Gearbox (DSG) transmission with Tiptronic, and have the performance of a manual with the effortless precision of an automatic transmission. The DSG uses an automated dual-clutch system that instantly engages and disengages gears without the need for a driver-activated clutch pedal. A computer engages one clutch on the next gear needed, just as the clutch from the previous gear is released. Each resulting shift is quick yet smooth, and lacks the power loss that occurs when using a traditional manual transmission. Tiptronic mode stops the transmission’s automated shifting and instead lets you control gear changes by either tapping the gearshift lever up or down, or using the shift paddles mounted on the steering column. 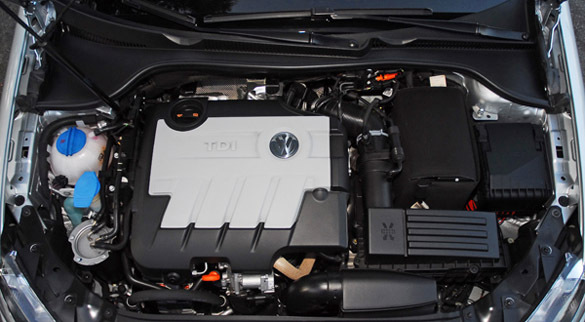 With the DSG transmission, the Golf clean diesel TDI gets 30mpg/city and 42mpg/highway and the same 0-60mph time. The German engineered Golf TDI loves to be driven and it inspires you with the confidence to do so with ease and comfort, whether cruising along the highway or taking on the twists and turns of country roads. 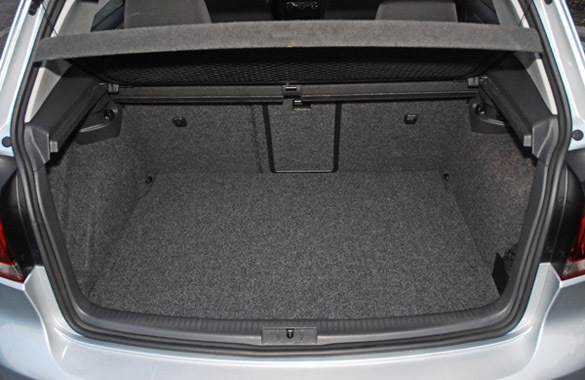 At its core is a laser-welded unibody construction that remains stiff and helps keep everything in line as the Golf TDI zips along. Up front is a sport-tuned, independent setup with MacPherson struts, coil springs telescopic gas-charged shocks and a stabilizer bar for improved road-hugging dynamics. The rear setup is an independent sport-tuned four-link setup with coil springs, telescopic gas-charged shocks and another stabilizer bar to keep the Golf TDI agile yet rider-friendly in most any driving situation. Steering is enhanced with an electro-mechanical, variable-assisted, power rack & pinion system that, when combined with a quick ratio, gives you an unprecedented level of control and accuracy in the corners and out on the straights. 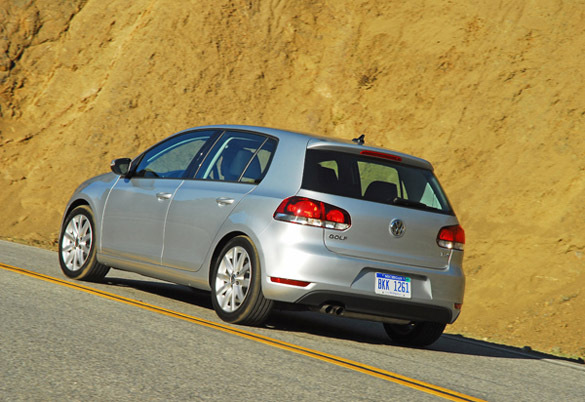 Slowing the Golf TDI down from are large, 4-wheel, power-assisted disc brakes. Up front are 11.9 inch vented discs clamped with dual piston calipers and 10.9 inch solid discs in the rear clamped with single-piston calipers. Standard ABS, EBD, BA electronic differential lock, Traction Control and the Electronic Stability Program all work seamlessly to keep you in control when riding on slick or wet pavement and during severe braking situations. On the inside, the latest Golf carries it refinement throughout with a variety of stylish additions that aims to keep drivers and passengers comfortable and pleased. All models start out with eight-way manually adjustable sports bucket seats which include two-way adjustable lumbar support, and adjustable head restraints. 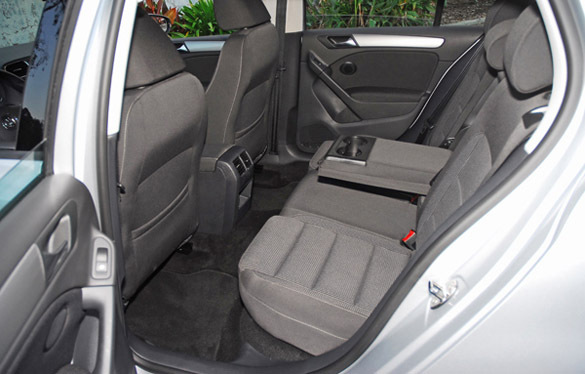 The rear seats include adjustable head restraints for all three seating positions, a center pull-down armrest with dual cupholders and have a 60/40 split folding capability for maximizing cargo space configuration when needed. 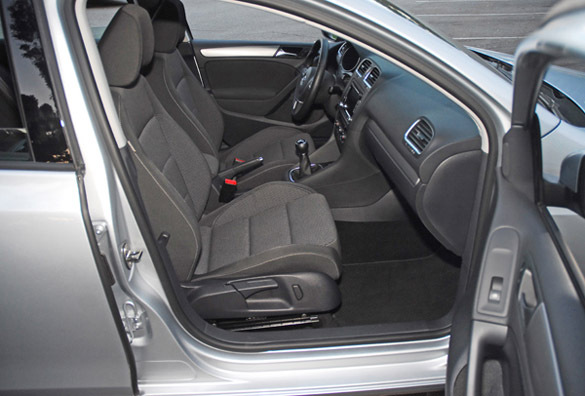 Both the front and rear seats come standard with VW’s ‘Me2’ cloth fabric. Heated seats are optional which also adds to the cold weather package’s heated windshield nozzles. The new three-spoke steering wheel features an embossed center section, and is upgraded to a leather-wrapped version with multifunction controls on TDI models. Brushed metallic appearance trim inserts are standard on the dash and in the door panels and accent the redesigned instrument panel and center console. Chrome trim surrounds the tachometer on the left side, which incorporates an integrated temperature gauge, and the speedometer on the right has an integrated fuel gauge. 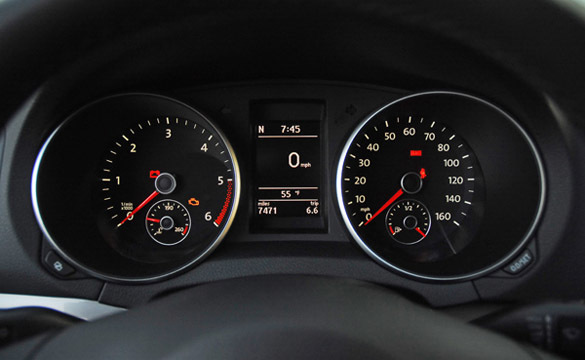 Located between the black analog gauges is a multi-function onboard computer display. A sunroof is also optional. All switches, dials and buttons are within easy reach and fully illuminated for safe nighttime travel. Standard on the TDI model is a touch-screen 8-speaker sound system featuring AM-FM-SIRIUS satellite radio, in-dash 6-CD changer with MP3 CD readability, theft deterrence, and an auxiliary input jack. Mobile Device Interface (MDI) is also standard in the TDI. A 300-watt Dynaudio Lite premium sound system is also optional. The TDI can be ordered with the new touch-screen navigation system with a 6.5 inch high-resolution display, integrated 30GB hard drive, WMA/MP3 audio CD playback, DVD playback, and SD memory card slot and a 3.5mm auxiliary input jack in the center console. Standard features not mentioned above include single-zone automatic climate control/CFC-free, power, heated outside mirrors, adjustable intermittent front wipers/washers/rear wiper/washer, cruise-control, remote keyless entry, power windows/all express up/down, anti-theft alarm/immobilizer, dual illuminated vanity mirrors, grab handles above each door, dual map lamps, storage slots in each door, rear reading lamps, foglamps, front and rear carpeted floor mats. Standard safety features include front/rear/side crush zones, driver/front passenger airbags, driver/front passenger side airbags, side curtain protection head impact airbags front/rear, 3-point safety belts for all five seats with pretensioners/load limiters up front, height adjustable front safety belts, LATCH system for child seats, tire pressure monitor, and child safety door locks.